I think as a mum, I was very lucky with my two eldest kids, they always slept through the night, they will eat anything you give to them. Even when it came to going to playschool and school, I didn't even get a goodbye, they just ran off and started making friends. So when Gracie arrived I thought I knew what to expect, how wrong I was. She was like the polar opposite of her sisters. Up until she was a year old, I was the only one that could calm her down, she refused to go to anyone else, if she did she would just cry and cry some more. When it came to feed times, it was a daily battle to get her to take her milk, I thought things would get better when she started on solids but even now she eats like a sparrow and changes her mind on a daily basis on what she likes to eat. The one thing she did was sleep through the night, this managed to keep me sane! 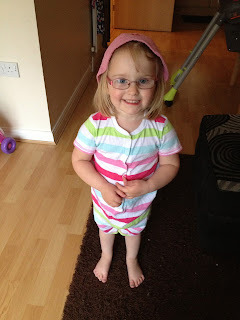 When she turned two she started to go to playschool with her older sister Freya, she was happy, went in like her sister without complaint. Playschool were always commenting on what a happy little thing she was, a far cry from what she used to be like as a baby. Even when her sister left and went to big school, she remained content, making friends and drawing lots of things to put on my fridge. 3 weeks ago this all changed and she has started breaking my heart on a daily basis. I don't know what happened, when we are walking to playschool she is all smiles, even as she is walking through the door, the smile remains, as soon as I go to leave, the bottom lip comes out. She has started to cling to me, the teachers have to pry her off of me and I have to listen to her scream as I walk out of the door. I hate leaving her like it but after 10 minutes or so she is fine and when I pick her up she is back to being her chirpy self. Myself and the teachers have tried to get to the bottom of the problem but all we get is that she doesn't want me to leave, I might be able to understand if she had always done this but it has come out of the blue and I feel extremely guilty leaving her upset. I'm not quite sure how to go about rectifying the situation, it is something I've never dealt with before, seeing your children sad is a very difficult part of parenting, I really wish I had a magic wand sometimes!! I'm hoping some of you lovely readers can offer some words of advice, perhaps you've dealt with a similar situation, or maybe you are going through the same thing as me now?? Would really love to hear from you. I hate it when they do this. It makes your heart break however having worked in nurseries and with children for over 14 year's I do know it usually stops after about 7-8 minutes. Poor you, I really feel for you. I remember my son Alex did exactly the same when he was about 3. It was entirely out of the blue for no apparent reason. You could ask playschool whether they've had any major changes at all? e.g. change of staff/change of routine, things like that. Toddlers need routine, and a sudden change in their little environment can unnerve them a little bit. How long is she at playschool for? Is it a whole day? What was happening before? Were you leaving Freya at playschool and then coming home with Gracie? It might simply be that she's suddenly realised "this is for keeps". At first, it was all new and a bit of a novelty and "things will get back to normal" (i.e. go back home with mummy) just like before. Lots of hugs and cuddles, which I'm sure you do already. It will get better in time, but it is heartbreaking at first, isn't it? No sudden changes that I know of, she got a new teacher a few weeks ago but she has been her favourite teacher since she started so I can't imagine that being a problem as such. she has been going to playschool by herself now since September which is why it is so strange for her to all of a sudden be like this. Thanks for your comment!!! I think I will ask them at playschool if anything else has changed. Aww, it must be horrible. I've also spent tim working in a nursery, and 7 years as a Childminder, and I know that they usually calm - tragically my own 3 year old screamed solid for 2 hours and then went to sleep under a chair when we left him in a creche at school to go and watch a play, so Nursery next term should be interesting, if very hard for the first few days! Speak to her, ask her why she cries, she probably can't tell you unfortunately and it's possible she's just tired. Towards the end of the Summer term I find children really are ready for a break, especially if they're younger. Thank you for your comment. I hope your little one has a better time at Nursery next term!! They really do know how to play with our emotions don't they. When my son was a preschool we had problems to start with, it would get better for a while, then worst and so on. I stayed out of sight one week and watched him & he was fine and enjoying himself. It reassured me, but I never really found a way to deal with it. He was fine when he went to school though. these things are sent to try us aren't they!!! Hi there. I found you through the weekend blog hop. Mushroom does this from time to time, usually when he's not had enough sleep but since about 18 months he keeps going through these super clingy phases. I believe it's separation anxiety, which I am told peaks again around this age. A child who talks more than Mushroom once said 'Will you come and get me Mummy?' so it may be that she needs extra reassurance that you'll always come back. Mushroom now stops crying the second I leave the room so his may be habit but a suggestion - that worked for a friend - was to give your daughter something of yours, that seems important but isn't. An old bunch of keys or a purse with unimportant business cards in it, perhaps. Tell her she needs to look after it til you pick her up - this reassures her you'll be back. Worth a try!